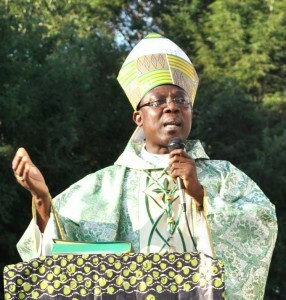 Statement by Bishop Dennis Kofi Agbenyadzi, S.M.A. 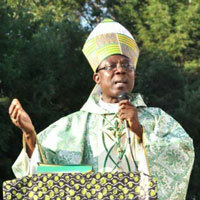 Challenges Facing the Catholic Church in the Central African Republic. The Central African Republic is one of the mineral-rich countries among the central African states. The estimated population is 4.5 million. Despite its rich deposits of minerals (diamonds, gold, uranium, etc.) the majority of the population lives in abject poverty. Thirty per cent of the population lives in urban areas, while seventy per cent resides in the countryside. Over the years, the Catholic Church and other Christian churches have played a decisive role in shaping the spiritual and social life of the country. Catholic social initiatives in the realm of development fall into three major domains: education, health services, and community development. In the rural zones in particular, the Church has carried out endeavors in the provision of clean water, the establishment of skill-training programs, activities promoting the well-being of women, programs in micro-finance, and agriculture. Recent political instability and social upheaval in the wake of the change of government of March 24th, 2013 have caused the general population and the Catholic Church great suffering. The precarious socio-political context has resulted in widespread insecurity, the systematic destruction and looting of both public and private property, and acts of cruelty and sabotage. What is particularly disturbing is that these acts have been carried out by armed rebels ostensibly under the control of the government now in power. In solidarity with the citizens of the Central African Republic, the Catholic Church has called the attention of world leaders to these violations of fundamental human rights and to the lack of security that grievously affects the life of the population. In addition, the Catholic Church has petitioned the current government to assume its responsibilities to ensure the security of all citizens and their property, regardless of race, tribe, or religion, and at the same time, to assume effective responsibility for the harm done to Central African citizens, to the country’s infrastructure, and to Catholic properties, by its own armed forces. Finally, the Church asks the government to engage in the task of reconciliation in order that a state of peace and unity prevail in the Central African Republic. Part of this process must include the bringing to justice of all those who have deliberately inflicted such trials on the civilian population. The situation that faces the country in the near future is grim. The Catholic Church commits itself to work tooth and nail to uplift the people. The fear of the Church is that the country will be engulfed in a religious war that will be disastrous for all of us. Together with religious leaders, both Christian and Muslim, the Church is working to put in place a platform of dialogue. Such a platform would assist in identifying and in analyzing all the contributing factors that have led to the present breakdown of the social fiber. What is necessary is to breathe into the current situation a spirit of mutual trust, of respect, of tolerance, of dialogue, and pardon so that true reconciliation can take place. The challenges facing the Catholic Church in the Central African Republic are enormous. She cannot accomplish it on her own. She asks for your prayers and your solidarity. She asks women and men of good will to step forward boldly and generously to combat this situation of hopelessness and powerlessness.